This is our punk record - pure, raw and straight to the point: speed. Its V-twin, the most powerful one we ever muscled into a street bike, beats the battle drums at 177 hp, while its purebred chassis is set to stay ahead when the straight is devoured. When corners become prey. Even on a bad day, thanks to state-of-the-art rider assistance systems. No, scratch that. Grin amplifiers. BODYWORK & GRAPHICS: The bodywork with sharp rear end, extended tank spoilers and air intakes, the ultra lightweight chrome-molybdenum steel trellis frame and the ready to race WP suspension components convert brute power into a usable tool. The elimination of plastic parts shouts 'NAKED' and create a BEAST which is always READY TO RACE. LED HEADLIGHT: Form and function are integrated beautifully in the 1290 SUPER DUKE R. Take the headlight for example, a highlight in this bike’s design. The central aluminum heat sink holds the LEDs and keeps the unit cool while it’s busy combining optimal illumination of the near field with maximum light output. And the daytime running lights, which consist of 6 LEDs, ensure that the motorcycle is perceived better and is more differentiated by other traffic users, thus offering massive safety benefits. SHARP REAR END: The slim and high tail section emphasizes the compact silhouette. Round shapes made way for straight lines, clarity and the promise of a radically thrilling ride. Which this bike actually delivers. SIDE FAIRINGS AND AIR INTAKES: It was essential that the increased performance of this second generation is visible at the very first glance. Therefore, the side fairings are extended more towards the front in order to emphasize the predatory nature of the Beast. The ‘R’ on its flanks really does stand for its roar. TFT COLOR DISPLAY: A multicolor combination of relevant information, presented in a clear-cut, uncluttered way. As you rev the engine, the display bars change color, either spurring you on or telling you to back off when the engine’s still cold. The display also automatically adapts its illumination to the ambient light and gets racy when the optional track ride mode is selected. BRAKES: More than adequate deceleration is ensured at the front wheel on the KTM 1290 SUPER DUKE R by the two radially mounted Brembo M50 Monobloc four-piston fixed calipers with 320 mm twin-disc brake with two floating discs and a radial hand pump. The spacing between hand brake lever and handlebar is adjustable so that the lever is within easy reach for every rider. The front brake receives effective support from the disc brake on the rear wheel, which features a 240 mm diameter disc and a two-piston Brembo caliper. The enormous potential of the Brembo brakes can be exploited to the full on the KTM 1290 SUPER DUKE R thanks to its sportily tuned and lean-angle sensitive anti-lock braking system. 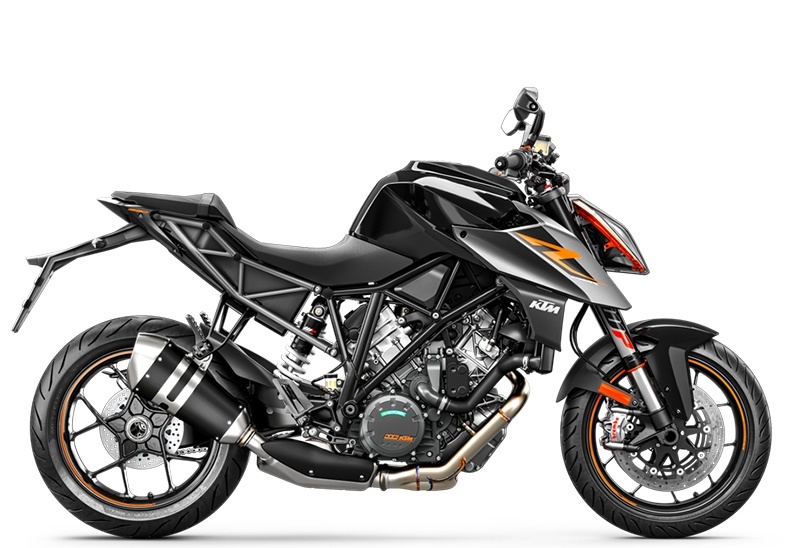 CHASSIS: With its ultra-lightweight yet extremely stable trellis frame, a beautifully manufactured single-sided swingarm and state-of-the-art WP suspension components, the KTM 1290 SUPER DUKE R exceeds all requirements for stability and control. Tubeless wheels, 17-inch front and rear, with the latest Metzeler M7RR tires offer tremendous traction on asphalt and let you exploit the bike’s capabilities to the fullest. Feedback? Check. Safety? Check. Fun? Double check. SINGLE-SIDED SWINGARM: The jaw-droppingly beautiful, light alloy, single-sided swingarm on the KTM 1290 SUPER DUKE R is not only extremely lightweight, but also precisely manufactured and generously dimensioned – a potent partner when the SUPER DUKE R unleashes its torque and riding dynamics. The rear wheel is fitted to an axle 50 mm in diameter and bolted in place with a 60 mm central wheel nut. The design of the swing arm is adapted optimally to the tubular trellis frame in terms of flexural behavior and stiffness. A high-precision, eccentric adjustment is used for tensioning the chain. ENGINE: This engine, in its latest incarnation, pumps out an arm wrenching 177 hp while its torque figures reach for the sky between 6,750 rpm (140 Nm) and 7,000 rpm (141 Nm). So it’s stronger than ever, but we made it run smoother than ever as well thanks to overhauled resonator chambers. All in all, weighing in at around 62 kg, the extremely slim 4-valve unit is one of the lightest big twins in the world. TITANIUM INLET VALVES: Another reason for the outstanding performance of the 1290 SUPER DUKE R 75° V-twin are the state-of-the-art, machined titanium inlet valves with chromium nitride PVD coating. Their flat design combined with the smaller combustion chamber offer a compression ratio of 13.6:1. Interesting fact: The titanium valves only weigh 39 grams each, which is 19 grams less than the steel inlet valves we used before. CYLINDER HEADS: Thanks to the resonator chambers on the cylinder heads, designed to polish the torque output in the lower to mid-range rpms, the 1290 SUPER DUKE R power train runs smoother, consumes less fuel and cuts down on CO² emissions by about 10%. RIDE-BY-WIRE: Instead of the electronic injection system's throttle valves being controlled by cables, ride by wire generally processes throttle twist grip movements with the help of electronic sensors and activates the throttle valves accordingly using servo motors. However, our ride by wire on the KTM 1290 SUPER DUKE R goes the extra mile: It electronically translates the throttle commands of the rider into the best throttle valve positions for the current riding situation. Choking, jolting and involuntary wheelies are a thing of the past. Voluntary ones, however, could easily be a thing of your future. CRANKSHAFT: The responsiveness and free-revving nature of the KTM 1290 SUPER DUKE R’s engine are also enhanced by the very low reciprocating weight of its crankshaft. Moreover, the flow-optimized shape of the crank webs boosts the particularly low-loss running of the crank drive. For motor stability, the thickness of the crankshaft’s cone has now been increased by 3 mm than its predecessor. PISTONS: The forged piston structure on the KTM 1290 SUPER DUKE R, borrowed from Formula 1 technology, results in a high loading capacity, despite the extremely short and lightweight design. Reciprocating weight is minimized, thereby maximizing the rev-happy nature of the engine. Furthermore, the piston skirts have a state-of-the-art, hard-anodized finish. Not only does this minimize friction, it is also extremely hardwearing. INTAKE FLANGE: An intake flange is more than the plumbing that connects the throttle body to the ports in the cylinder head. It is an integral part of the induction system and has to match the airflow characteristics of the cylinder head and camshaft, as well as the displacement and rpm range of the engine. KTM developed a 10 mm shorter intake flange that perfectly caters to the engine’s needs, enhancing the power output and widening its powerband by 500 rpm. Thunder along and surf its torque or whip it hard and meet the Beast. TWIN IGNITION: The twin-plug ignition system controls the two differently sized spark plugs in each cylinder head independently of each other in such a way that more efficient combustion and a smooth, optimally controlled ignition sequence are achieved at all times. The result: more power, better feedback, lower fuel consumption and lower emissions. And so the world is a better place. EXHAUST: The KTM 1290 SUPER DUKE R’s exhaust system is made entirely from rustproof stainless steel and is Euro 4 homologated. Hundreds of test bench runs and complex simulations ensured that the exhaust system, which uses an exhaust flap, contributes decisively to the extremely smooth torque curve and excellent emission values of this powerful V-twin. And did we mention the sound? While it whispers at low revs, it will take your breath away reaching for the high notes. HANDLEBAR: The 20 mm wider handlebar has been positioned 5 mm lower and 18.5 mm more to the front, so you’re READY TO RACE all the time. Handlebar: 22 mm adjustment range with four positions. FOOTPEGS: Brake and gear shift lever: three positions for the gear shift & brake lever. HAND LEVERS: Adjust the hand levers infinitely. MSC (MOTORCYCLE STABILITY CONTROL) WITH CORNERING ABS: Based on the state-of-the-art 9.1 MP modulator,the comprehensive Bosch MSC assistance package unites the talents of efficient braking and lightning-quick, efficient pressure modulation with the high quality Brembo hardware to make the most advanced braking system on the market. No one brakes more progressively or safely, even at extreme lean angles. If required, not only can it be switched off, but also be placed in Supermoto mode. RIDE MODE TECHNOLOGY: Ride mode technology provides the rider with a choice of three ride modes on the KTM 1290 SUPER DUKE R, which can be selected quickly and simply with the menu switch on the handlebar. In conjunction with ride by wire, the selected ride mode influences the general responsiveness of the engine, its maximum peak power and MTC intervention. "Street" and "Sport" modes deliver a full 177 hp and appropriately potent power development with a sporty traction setting. By contrast, "Rain" mode limits the maximum output to 130 hp with smoother performance and early traction control intervention. MTC (MOTORCYCLE TRACTION CONTROL): The Motorcycle Traction Control (MTC), a lean-angle sensitive traction control system, reacts immediately if the rotational speed of the rear wheel is disproportionate to the riding situation. In a matter of milliseconds, MTC reduces the engine output with an extremely smooth, barely perceptible intervention at the throttle valves, until the system has reduced slippage to optimum proportions for the selected ride mode and current angle of lean. Depending on the selected ride mode, MTC allows three different levels of traction slip at the rear wheel. ‘Sport’ is up for respectable drifts and a perceptible amount of slippage, ‘Street’ keeps things smooth for comfortable, controllable riding with full engine power, ‘Rain’ is all about early intervention and maximum grip in the wet. And that’s not the end of it. Daredevils, we give you: the off-switch. RACE ON SYSTEM: Forget about ignition keys and mechanically locked fuel caps. All you need is this transponder in your pocket and your bike within arm’s reach. CRUISE CONTROL: Equipped as standard with cruise control, long motorway journeys become a piece of cake. The system works in 3rd, 4th, 5th and 6th gear between 40 km/h and 200 km/h and is controlled by a switch on the left hand side of the handlebar. Press it and the cruise control screen comes alive in the TFT display unit. A downward push sets the speed and up or down manages it for you, so you’ll arrive at the fun bits with energy to spare. ATIR (AUTOMATIC TURN INDICATOR RESET): After 10 seconds of movement and 150 meters of riding distance, the turn signal will stop automatically. If pressed meanwhile, it counts from zero again. A big improvement in terms of safety, as it is now impossible to forget to reset the turn signals. KTM MY RIDE: A smartphone can be tethered wirelessly to the bike, giving you full control over incoming calls and an audio player. All the information pops up on the bike´s display as you manage this optional extra with the menu switch, keeping your hands where they belong. On the handlebar. TELESCOPIC FORK : With its multiple setting options for spring rebound, compression and damping, the extremely torsion-resistant upside-down telescopic fork from WP Suspension provides you with a personalized suspension set-up. Not only can rebound and compression damping be set separately, but also completely independently from each other thanks to the 'split principle' (the left fork tube controls compression and the right one rebound damping). This allows riders to find their dream set-up with speed and precision – key words at KTM. SHOCK ABSORBER: The directly articulated, high-quality WP pressurized-gas central shock absorber with external remote reservoir offers numerous setting options over a wide set-up range. Compression and rebound damping can be regulated independently – with separate settings for high-speed and low-speed compression damping. In addition, the spring preload can be adjusted by hand. The Beast is equipped with a harder fork spring than its predecessor (10.0 N/mm), while the preload of the shock absorber as well as the set-up of the fork and the shock absorber have been revised for high-speed excellence. STEERING DAMPER: With so much propulsive power, the front wheel could become very light, which might lead to unpleasant kick-back on uneven roads or following a slight stimulus at the handlebar. The 1290 SUPER DUKE R prevents this safely with a reliable and sensitive WP steering damper. WHEELS: The tailor-made Metzeler M7RR tires on the KTM 1290 SUPER DUKE R enter new technological territory. Derived from Metzeler’s experience in Road Racing activities, including the “Isle of Man TT”, they feature completely new profiles, structure materials, compounds and tread pattern. Even for wear, perfect steering behavior, grip in every situation and fantastic ride stability. The tubeless sport tires are fitted on extremely lightweight, light-alloy wheels manufactured in a low-pressure die casting process. Not only do the lightweight wheels make the bike lighter overall, they also minimize the unsprung masses and moment of inertia, with a positive impact on the handling and ride dynamics of the KTM 1290 SUPER DUKE R.